Maokong Gondola (貓空纜車) -This is a fun little trip, a small cable car that goes up some hills with the last stop being a place where you get tea or some refreshments. Getting tickets they have English speaking people to help. Go on a weekday as the weekend it's packed. There's also one day it is closed for maintainence every week (maybe Monday or Tuesday) so check before you go. It's located at the last stop of the Taipei Muzha line, which is also where the Taipei Zoo is located (that's better for little kids, but this zoo also has a panda which may be interesting to adults as they are so rare). 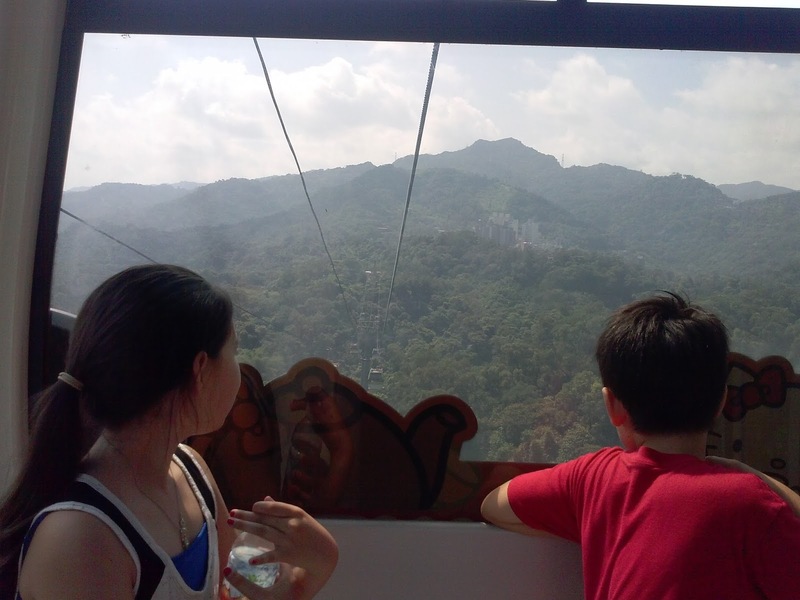 An image from the inside of the cable car is shown above. Ximending (西門町): This is kind of the outdoor shopping area that a lot of young people go to. They have shops for hats, cute tchotchkes, souvenirs from Taiwan, and other stuff. There's also a very interesting minimall in Ximending at the Wannian Building (70 Xiníng South Road), close to Exit 6 of Ximen Station. It's 5 stories tall, and it's a warren of weird little shops selling everything from puzzles to military surplus to Japanese robot toys. The top floor is an arcade which is a good place for a 12 year old to kill an hour — the games are mostly Japanese, which are seldom seen outside of Japan. Din Tai Fung (鼎泰豐) - this is a fantastic dumping restaurant, world famous! They have English menus. It really deserves its reputation. There are a bunch of them in Taipei, the ones I recommend are the original on Xinyi Rd or the Nanxi branch in the basement of the Shin Kong Mitsukoshi department store. There's also one in the Taipei 101 building (tallest building in Taiwan). Addresses are on the Din Tai Fung website. Traditional night market - there are a bunch of them accessible from the subway or taxi. It's a great place to try different food or get cheap clothes although I have to admit if you don't have a Chinese-speaker with you it may be tough! A small one that is easier to walk around and has a small temple to visit is Raohe Street Night Market (饒河街觀光夜市) - directions here.